Purpose/Objective(s):To report the results of the bladder sparing treatment in MIBC including brachytherapy BT and minimally invasive surgery since June 2009 when we transformed open surgery to a laparoscopic approach, in 2010 modified to a robot assisted laparoscopic RAL approach. Simultaneously, we changed from a pulse dose rate to a high dose rate HDR scheme. Materials/Methods:The procedure starts 8 wks after TUR of the solitary tumor, cT1-3aN0, grade 2-3, no carcinoma in situ, tumor size ≤ 5 cm, by a course of external beam irradiation EBI, 40 Gy in 20 fractions applied to a clinical target volume CTV including bladder and regional lymph nodes. One week after EBI, RAL-BTcatheter implantation procedure is performed. An additional partial cystectomy PC is performed in cases of >1 cm thick residual tumor in a resectable part of the bladder, diverticulum or distal ureter (plus ureter-reimplantation). Selective lymph node LN dissection in cases with MRI suspect LN. An afterloader with an Ir-192 source with activity 37-13 GBq was used The HDR fractionation scheme was: 25 Gy, 10 fr with ≥4h interval, 3 fr/day, prescribed at 5 mm from the catheters, starting a few hrs postop. In 2016 the decision was made to de-escalate the BT dose to 17.5 Gy in 7 fractions if PC was performed. Post-treatment cystoscopies and urine cytology were performed every 3 months, MRI and or PET-CT on indication. Results:Until June 2018, 119 consecutive patients (2% rec.pT1, MIBC) were treated, 4 patients excluded from final analysis (3out of protocol,1not completed treatment). Mean tumor Ø was 2.5cm. PC was performed in 38 patients(16residual tumor), the last series of 17 received reduced dose (de-escalation). In 36 patients PLND (resected LN n=175 with 4 metastatic) was performed. 2-6 catheters were inserted, mean V100 was 12.5 cc. The average received bowel dose was D2cc=8 Gy; D0.1cc=15 Gy. Median hospitalization time was 5.0 days mainly due to irradiation time, significantly reduced compared to the open procedure (13.5 days, N=96). Also, a significant reduction in BTcatheter accessibility problems was noted and implant quality parameters were comparable to the open procedure.16 patients developed toxicity(CTCAEv4): acute G3-4: delirium(3), ileus(1) pulmonary embolism(1), late G2-3: hematuria(3), urinary urgency(3), lymphedema(2), bladder necrosis(1), recurrent cystitis(1), hydronephrosis(1). No changes in sexual functions nor late deterioration of bladder functions were observed. The average duration of the follow up was 2.9 y (range 1m-8.8y). Survival analysis was performed using the Kaplan–Meier method: 2y local control was 82%, 2y disease specific survival was 89%. No in field local recurrences were observed in the PC group. 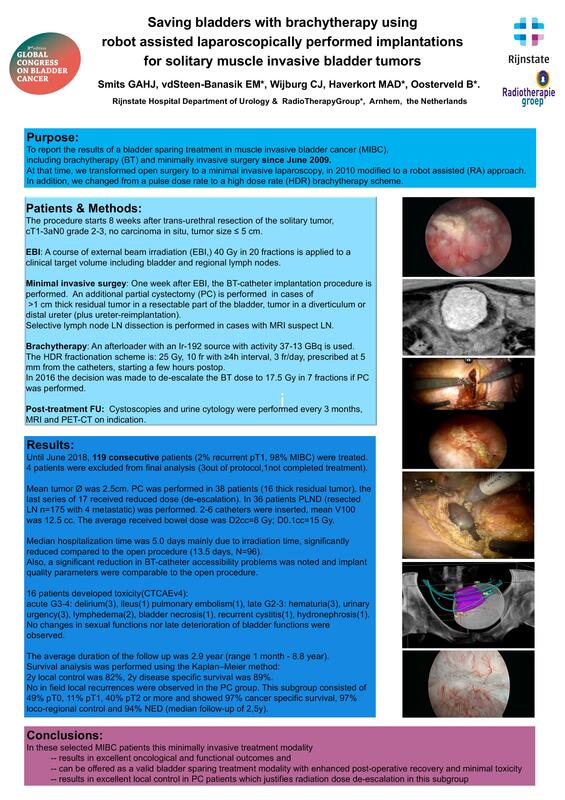 Conclusion:This minimally invasive treatment modality results in excellent oncological and functional outcomes and can be offered in these selected patients as a valid bladder sparing treatment modality with minimal toxicity.